2 Who is it written for? This is one of a series of documents introducing Joomla! 1.5 and it is part of the background to creating a new site. to explore how the content of Joomla! sites is organised in a hierarchy, using Sections, Categories and Articles. to demonstrate how to decide which Sections and Categories are needed for a new site. There are four aspects to designing a new Joomla! web site. These also apply to planning to make alterations(including upgrading versions J1.5 to J2.5+) to an existing site or planning for transferring a site that already exists in another form into the Joomla! CMS. The Sections have been removed and now the content hierarchy is Categories and Subcategories. These should all be based on the purpose and expected content of the site, so you do need a clear idea of what you are trying to communicate and plan accordingly. Easier said than done! Everyone: who is going to create a Joomla! site. It will also be useful to someone who is going to alter a Joomla! site. It is written on the assumption that you do not have experience of the structure of a Joomla! site. Joomla! has a hierarchical structure in the background for organising the content of the site. You need to know about this because it is better to plan ahead and exploit the content structure than set off in a random direction. This equally true whether you are creating a new site or altering an existing one. Articles: which are in Categories. You should already be aware of the vocabulary of Sections, Categories, Articles and Menus from other documents in this series. These can best be explored by looking at the Administrator pages of an existing site. Login to the Back-end of a web site with content. The localhost site with the sample content is an ideal example. Explore the Categories, Sections and Articles and note how they relate to one another. Sections are the top-level of organization. They should reflect the purpose of a site. Click on the Section Manager icon in the Control Panel. The sample data on localhost has three sections, About Joomla!, News and FAQs. These are enough for this small site to divide the content in a logical way and support the purpose of the site, which is to give helpful advice about Joomla!. Click on the name of the Section to view details - and to edit them. 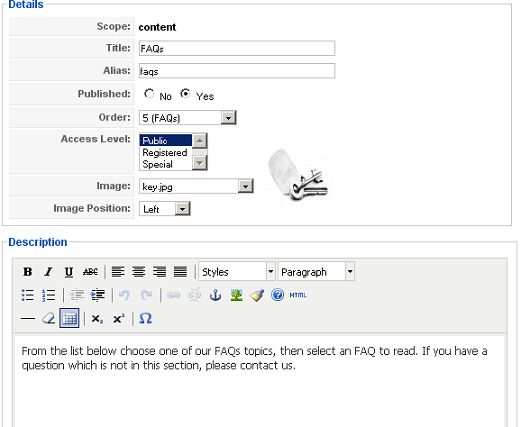 This displays the Workspace page which consists of Details and Description parts, as well as the usual Toolbar icons. The data in the Details and Description parts can be altered here. The Description appears on the Site when a Menu is created to list the contents of the Category. (Cross ref below for detail). This too can be altered using the same editor as that used for Articles on the site. Help For a lot more detailed information about what you can do using the Section Workspace page - click the Icon at the top of the screen. Categories are the second level of organization. Every Section contains one or more Categories. There is a special Section, built into Joomla!, called 'Uncategorized'. This is outside the content hierarchy but can be displayed through a menu item. Click on the Category Manager icon in the Control Panel. The sample data has nine categories. A larger site - or one that exploits Categories for displaying Articles - can have a lot more. Click on the title to open a Category for editing. This will show the Workspace page which is similar to that for Sections, except that it allows the Section to be chosen or displayed. Note that the Category Manager lists which Section the Category is in. Explore this as needed - it is where you can publish/unpublish Categories or alter the order in which they are displayed in pull-down lists. Sections, Categories and Articles work together to create a hierarchy of items. Sections and Categories group articles in a logical structure that makes the site easier to use, manage and understand. Articles are organised inside Categories, which are themselves organised within Sections. This is the organisation of the Articles in the Back-end. This structure is used by the Menu system. But the menus are not necessarily the same as the back-end content structure. 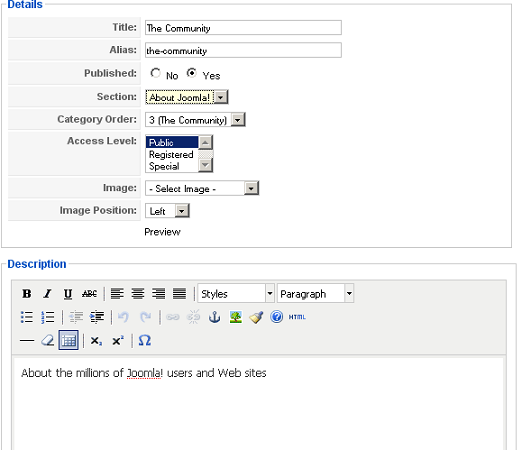 There are built-in layouts in Joomla! that take advantage of this organization and make it possible to list articles that belong to Sections or Categories. There is no automatic way to do this - you have to think about it and whether you are going to want to exploit blog and list layouts. Note that the sample site - and many others - use a variety of techniques. They do not limit themselves to one level in the hierarchy but set up the design to allow for multiple levels of content and also some blog and list layouts. The key is a good understanding of the purpose of the site and what features will be displayed. This is not entirely straight forward. When it has all been done and in retrospect, it looks easy. But it is actually challenging to identify the main Sections / Categories and translate these into likely content. These can be very varied as a sailing club one illustrates: the content is quite complex because such clubs have a lot of activities, they have boats and they usually have a property of some sort. They also aim at different people - sailors, social members, young people and learners. It is not a business but it does want to encourage people to join and wants to give a lot of on-going information about club activites and local sailing conditions. There are about 1500 sailing clubs and associations in Great Britain alone and the web sites are all different. There may be people who want to enter their own content, so you could have a number of Authors or Publishers responsible for adding detail about events or reports on events or descriptions of boats and much else. So such a site could be very varied and quite dynamic. There are many organisations who want to keep their members in touch with one another and also provide information about activities. There are also orgnisations who want to disseminate informatation, or even to campaign on particular issues. They may need a less complex structure than a club, but might expect a certain amount of interactivity with people contributing content and news. Web sites for personal information work very well in Joomla! because you can have some items open to everyone and others restricted to a few friends and family. The structure could be quite varied if you have a lot of interestes or separate things you want to write about. On the other hand, it is likely that there will not be many people adding content. How clear are you as to what the content will be exactly? It may help if there is an existing site, or a similar one which will give hints about likely topics. What are the main topics to be covered? Some sites lend themselves to being thought of as hierarchies and others do not fall so easily into place. There may be a number of separate topics, for example. The final design depends a lot on the range of content and how you think of it in a Section/Category hierarchy. If you are not in a hurry and not very experienced, there is a lot to be said for Serendipity, that is to say finding out about your requirements as you go along. So you do not have to stick rigidly to your initial thoughts. It worth having an inital plan, even if you do change it in the light of experience. The advantage of thinking it out is that you do not get distracted by how you are going to implement the design - you just focus on the content. Make an initial list of the content you know is going to be displayed on the web site. Then add a note as to whether the items can be grouped in any way. Take some slips of paper and on each one write the name of an item of content. this helps you group things together. Consider things like whether there will be a lot of content changes and who might update it. They can be moved around and as you do this - you will notice things you have not included. List the Sections and Categories out clearly ready to create them on the web site. The example below takes part of a design for a sailing club web site showing how the basic information about the club could be designed in Section and Categories. Here the site is presenting some information about the club. The whole web site would have maybe five or six Sections and a number of Categories under each Section. They would be based on the kinds of information that members and others need, such as programmes of events, weather conditions, the kinds of boats sailed and so on.